* This column was originally in the Petaluma Argus-Courier and on its website. Casa Grande High School head baseball coach Paul Maytorena usually doesn’t use Major League Baseball players as a model for his players because of the vast differences in the games. For the first fall baseball game of his team’s season, Mayortena used one player as his model. My phone sat on my lap, speaker-phone on, wanting to honk at the lady going at a snail’s pace in front of me, but the only noise I wanted to hear was my dad’s voice giving me the play-by-play of the inning. I knew with a solid three-run lead and one of the best closers in the game, my goal would be to see the last out or at least have my dad, who taught me how to play baseball, be the voice of Jeter’s last play in Yankee Stadium. Leading off for the Orioles was right-fielder Nick Markakis. Yankees closer David Robertson walks him, never a good start to an inning, but still a three-run lead is plenty. Next batter up, Alejandro De Aza, strikes out looking. Okay, only two more outs for Jeter, I have to get home for this. Adam Jones stepped into the box next and pulled a ball 395 feet over the left-field wall, making it a 5-4 game. Well, at least I have more time to get home now and maybe see the end. The biggest slugger in Baltimore’s lineup, Nelson Cruz, was fanned swinging, making it a two-out, one-run game. Then, Mr. Breakout Player, Steve Pearce, continued his heroics for the Orioles with a 399-foot blast to left field, tying the game at five runs apiece. You have got to be kidding me. I couldn’t believe a word my dad was telling me. First thought: “There’s no way they can blow this game for Jeter.” Second thought: “Wait a minute, Jeter’s up third this inning.” Get me home! David Robertson must know what he’s doing, right? JJ Hardy flew out to center field for the last out, and I drove up our gravel driveway right as the bottom of the ninth inning started. Leading off the inning, rookie Jose Pirela, who I, admittedly, had never heard of until that at-bat, smacked a single by the third baseman that rolled to left field, and I officially began to get nervous. Antoan Richardson pinch-ran for Pirela, and Brett Gardner came to bat. With perfect execution, Gardner laid down a sacrifice bunt, moving Richardson to second base with one out. “Now batting for the Yankees, Numbah Two-ah… Derek JE-tah. Numbah two.” While Jeter exits, so does the legendary Bob Sheppard, the only Yankee announcer to speak Jeter’s name. I’ve never been so nervous as a fan in my life. Jeter walks to the plate with not a person in the entire stadium sitting down, and takes one practice swing. He steps into the box, taps the end of his black P-72 Louisville Slugger, and begins fuddling with the left ear flap of his helmet. Like a swinging pendulum, his bat sways in a circular forward motion three times before he puts his hands up, rocks back and is ready to hit. The same routine Jeter has done for 20 years as a big-leaguer. “He had a simplified routine and approach every time. It doesn’t matter if you play in New York or Petaluma, you have to make the game as simple as possible and that’s what Jeter did,” Petaluma High School head baseball coach, Paul Cochrun said. On the first pitch of the at-bat, Evan Meek throws a cutter on the outside-half of the plate, Jeter whips his bat back-and-forth, turns his hands inside and hits a one-hop shot to right field past the glove of a diving Pearce at first base. My dad and I leap as high as we can off our chairs in my parents’ living room, and the cat scurries out the door. The next image is Jeter jumping with both arms stretched high and wide into the air, like a 12-year-old at his local sandlot field that always pretended to be the captain of the Yankees, but this is no dream, no movie, but instead another Jeter memory for the ages. I never expected it, but I was hit with a bus of emotions after that. I went from screaming and hugging with jubilation for my childhood hero, to sitting with my hands over my eyes trying not to cry. 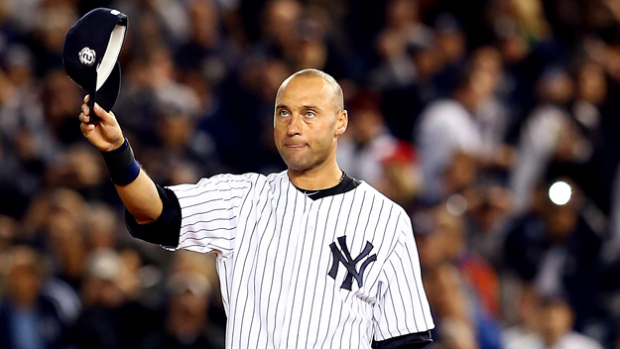 A part of my childhood was gone seeing Jeter wear the pinstripes one last time. No more flip play, jump throws, flying into the stands on a sprinting fly ball catch, no more Mr. November, no more captain of the New York Yankees. That’s the beauty of Jeter’s career though. He will finish his career with a .310 batting average, 3,465 hits, 1,923 runs scored, 1,311 RBIs, 260 home runs, 358 stolen bases, 14 All-Star Game appearances and five World Series rings. This year, Jeter has been praised in every city he has played in, and he’s also heard how he’s overrated, his defense is terrible, and he hurt the Yankees this season. But, he never seemed to be phased by the admiration or the scrutiny. “He was a great teammate and leader, and didn’t let the pressure or scrutiny take him away from what mattered in the game,” said Cochrun. Jeter spent 20 years in New York playing for the most popular sports team in America and maybe the world, as the team captain, starting shortstop, and a single man. Still, he kept his record clean, which perhaps was just as important as his stats and World Series rings for baseball. His dream as a child was to play shortstop for the New York Yankees. He fulfilled his dream, never feeling like he was doing more than simply going to work and doing his job. It felt as if Jeter was born to be a Yankee. Clean shaven, and the perfect captain, leading a clubhouse that was notoriously full of drama. After he was mobbed by his teammates for his game-winning hit, the first thing Jeter did was tuck his jersey in. Who does that in an age where swag is more popular than leadership? Derek Jeter was the unblemished face of baseball the league desperately needed with the MLB’s image being steroid kings whose heads were growing bigger than the pitcher’s mound. When he is enshrined in the Hall of Fame, I won’t remember all of his stats, but all of the reasons why he was a role model for kids like me and all others around the world that loved the game, and that will be irreplaceable for the Yankees and baseball alike. Have you seen his Gatorade commercial? It is amazing & you should YouTube it right now if you haven’t seen it. I’ve seen it about 408 times and get chills every time still. A player that will not be replicated.